The best place for your players to park is the parking lot located off of Mountain Trail Street. To get to the Mountain Trail Parking lot exit the 23 freeway at Tierra Rejada Road. Take Tierra Rejada road west roughly 3 miles to Mountain Trail Street. Make a right on Mountain Trail Street and look for the entrance to the parking lot next to the baseball field. Teams will be able to warm up on the Junior Varsity Practice field located off the Mountain Trail parking lot next to the gym. There will be a snack bar located in the gym and restrooms will be open adjacent to the snack bar on the side of the gym closest to the track. 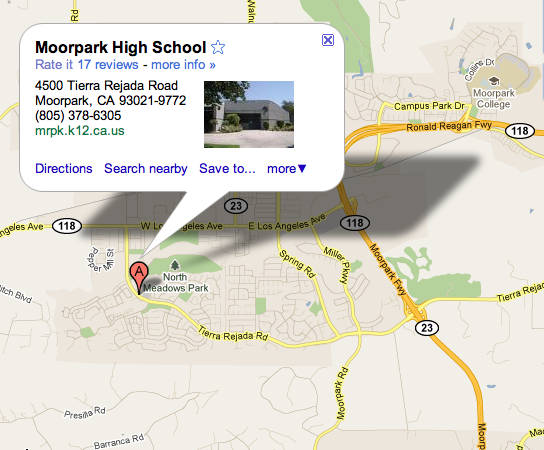 Both teams will be sitting on the “home” side of the Moorpark High School Stadium. Please be respectful of other fans and do not erect shade canopies that block views of the finish line. Shade canopies should be put up below the announcer booth. The Staging area is located at the west end of the track. Please arrive by second call. Midget, Bantam and Gremlin Teams should send a coach to staging to help supervise and organize their athletes (in fast to fastest order). Coaches can check in for athletes at the field events (you can bring all the competitor labels for your team if you like). Please note that the Shot Put area is located behind the gym. The meet will start promptly at 8:30 AM so please tell your athletes to arrive by no later than 8:15 AM. We look forward to hosting you and wish your athletes the best of luck!